These unique bracelets will give your outfits a new style! 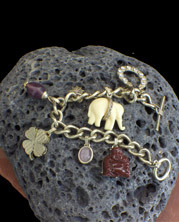 Lots of shimmer on this fun bracelet, lady bugs bring good luck! Are you feeling daring today? 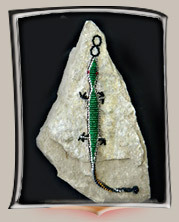 Charm your friends with this beatifully studded amber cobra. This piece came from Italy..I purchased it in Padua at a cute boutique there. 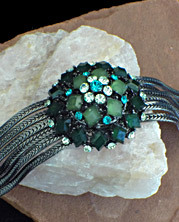 Nothing says “earthy” more than simple green wooden beads on stretchy cord for a snug fit. This expertly woven bracelet is full of purple glass stones and beads. 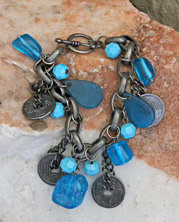 This metal and resin charm bracelet is bursting with blue and is a fun piece to wear! 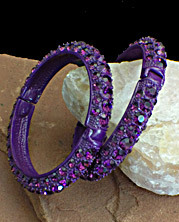 This set of two purple studded bangles are sure to add some sparkle to your ensemble! I bought this Liz Claiborne bracelet in the original box, I'm glad I didn't use the parts! 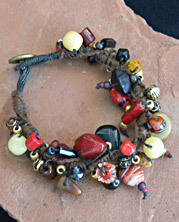 This expertly woven bracelet is full of every sort of glass and stone beads! Vibrant reds and oranges. Button and loop enclosure.